David Braden designed this home in Oak Cliff at 665 West Colorado in 1950. This home is just a cube with square-hipped roof but built on a severe slope by a creek and in a flood plain. It visually becomes a floating cube sheathed in redwood and brick, blending into the forest in the background. David Braden recounts that "In the early 1950s all the architects wanted to be in California or at least designing like the California architects." Harwell Hamilton Harris and his contemporaries were the inspiration for these Dallas architects. 665 West Colorado, with a half basement that also serves as the foundation of the house, is certainly reminiscent of this California style and even of the home Harwell Hamilton Harris designed a few years later on Rockbrook. 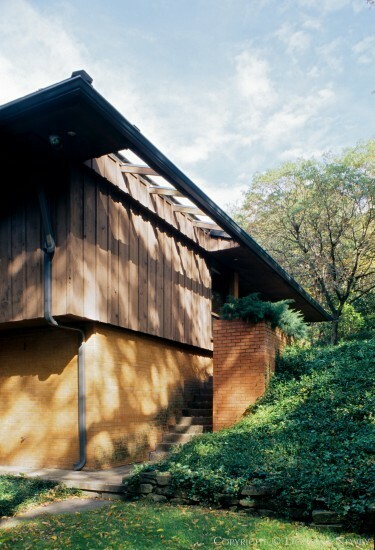 To a lesser degree, but like Howard Meyer, David Braden was also influenced by the work of Frank Lloyd Wright. Built in the depression of a flood plain, the home remains level with the horizon and simultaneously emerges vertically from the flood plain.